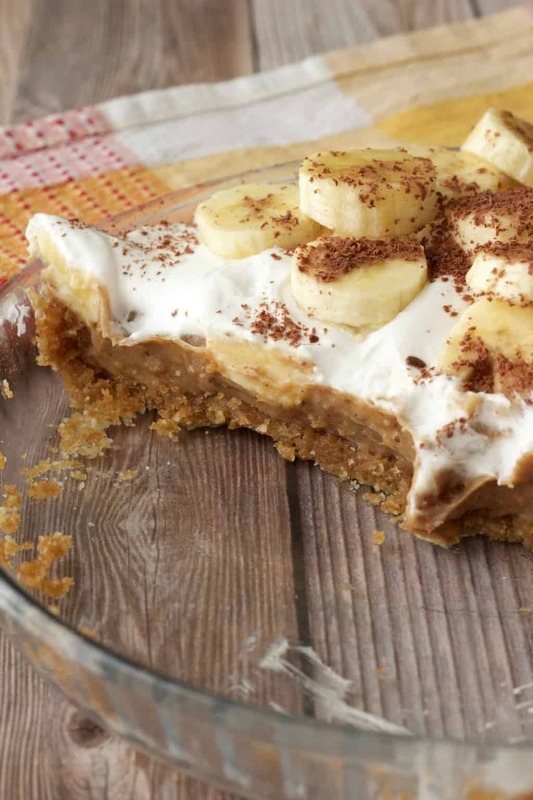 This vegan banoffee pie is no-bake, raw vegan, super easy and fun! 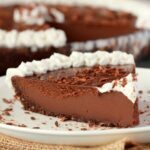 This is what you make when you want to please EVERYONE, it’s gluten-free, refined sugar free and raw. All this and it’s super delicious too! In fact if you want to keep its extreme dietary friendliness to yourself you can do that too! No one will even know. 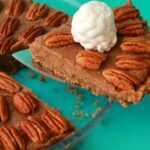 It’s super sweet, super creamy and as decadent as a dessert can be. This recipe is actually just 6-ingredients. Can you believe it? It’s just so easy. 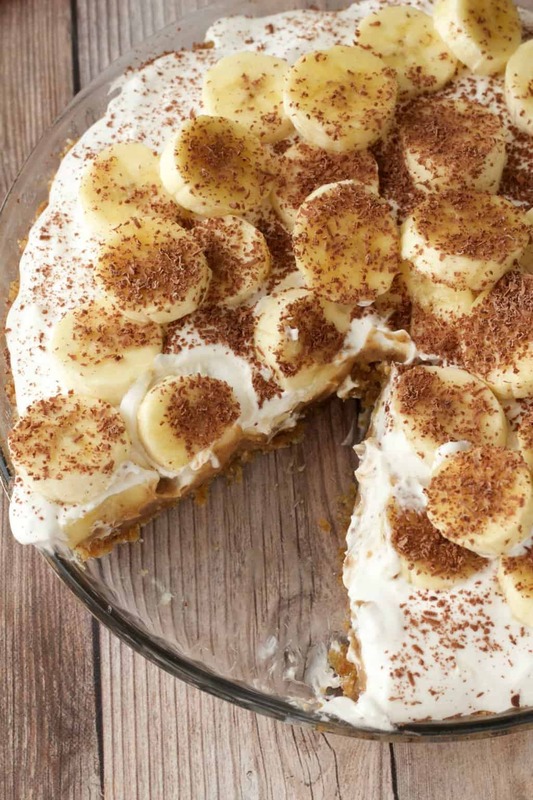 The crust is just walnuts and dates, the filling is dates, coconut cream and almond butter and it’s topped with whipped coconut cream and sliced banana. 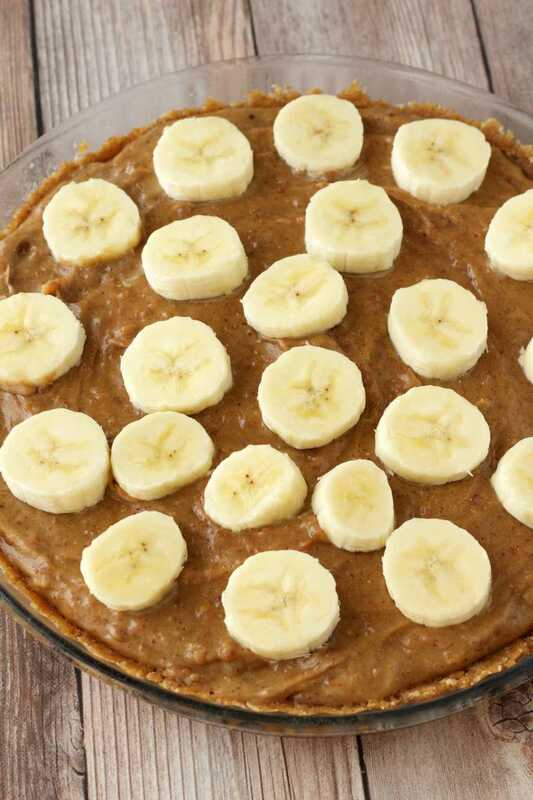 Note: even though I recommend you brush your bananas with lemon juice to avoid discoloration, this is still a super fresh easily oxidized ingredient, so this is not a pie that keeps for days on end. So eat it up quick! 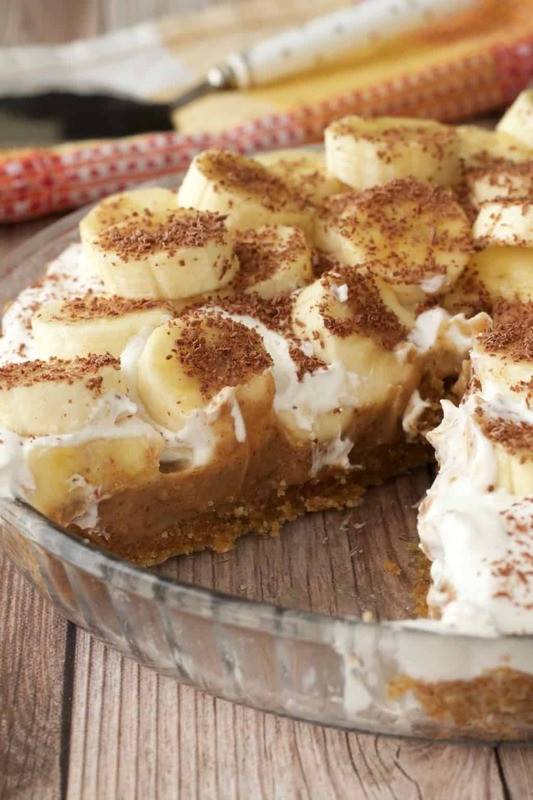 So let us know what you think of this gorgeous vegan banoffee pie! 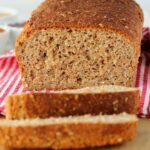 Rate the recipe and leave a comment! Also tag us #lovingitvegan on instagram if you take any pics of your creations, we definitely want to see! 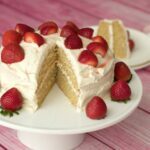 And sign up to our email list for an awesome free recipe ebook and to stay updated with all our latest recipes! 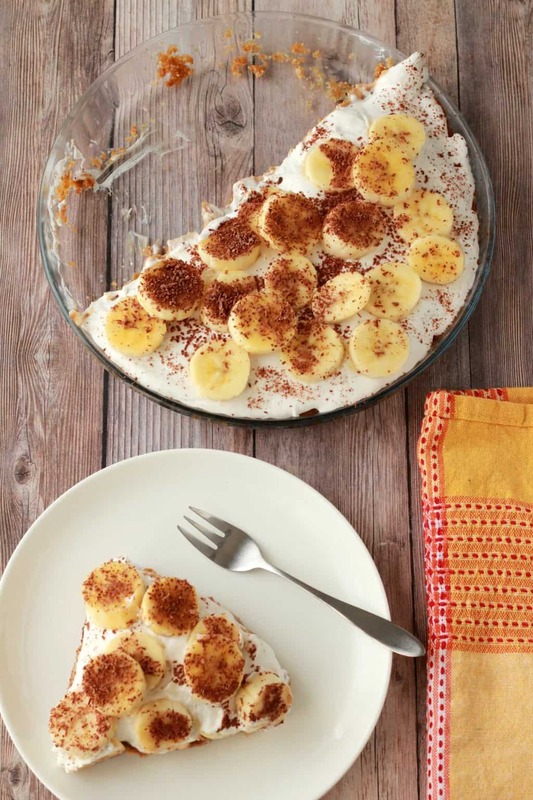 Insanely delicious no-bake vegan banoffee pie with a walnut date crust, date caramel center and whipped coconut cream topping, with loads of sliced banana of course! 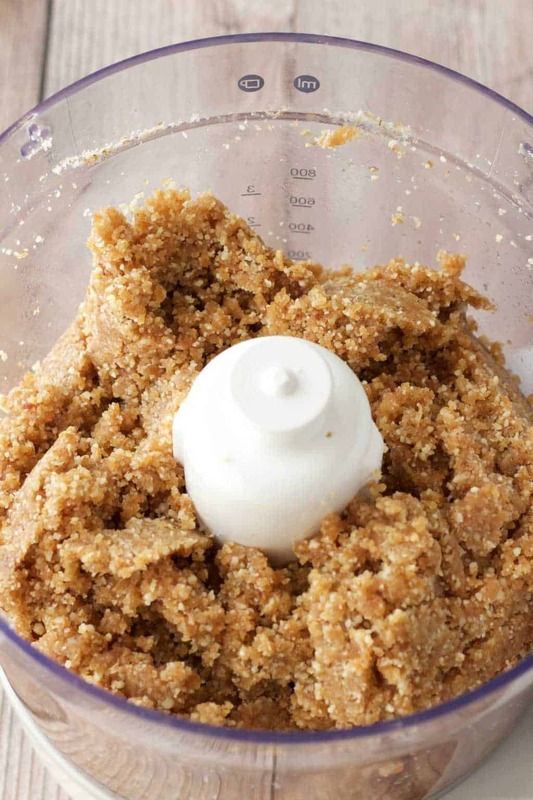 Add the walnuts and pitted dates to the food processor and process. It will first be crumbly and then gradually will become doughy and start to stick together as the nuts release their oils. Process until it reaches this sticky dough stage. Transfer to a pie dish and press down firmly, working it up along the sides a little bit. 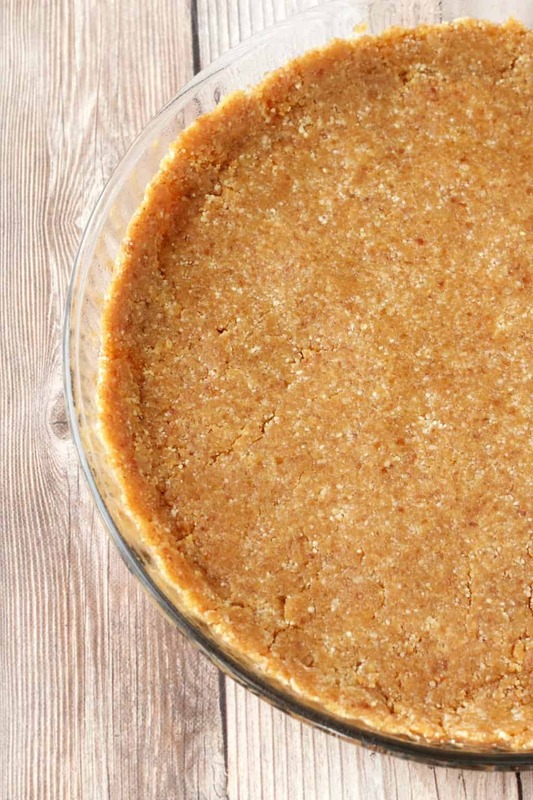 Place into the freezer to set while you make the filling. To make the date caramel a bit easier, first microwave your dates for 30 seconds, this will soften them up and make them easier to process. If you don’t have a microwave you can skip this step but it will just take a little longer. Add the dates to the food processor and process. 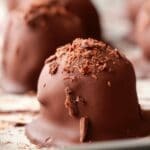 It will first form a giant ball of toffee and then will gradually break up and stick to the sides of the food processor. Keep processing, until the giant ball is mostly broken up. 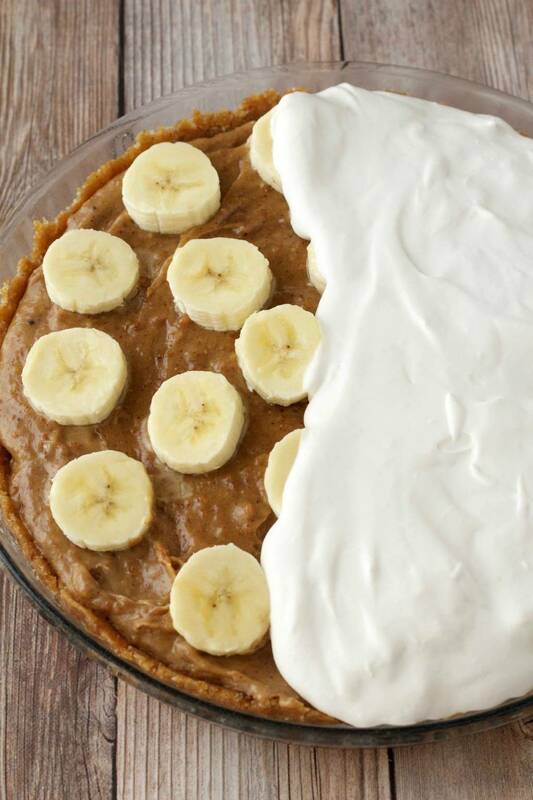 Heat the coconut cream in the microwave for 30 seconds and then add gradually while the food processor is running. If you don’t need the full cup, then don’t use it all. You are going for a very creamy date caramel texture here. 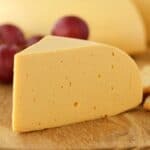 Thick is good, but you want it to be smooth and creamy. 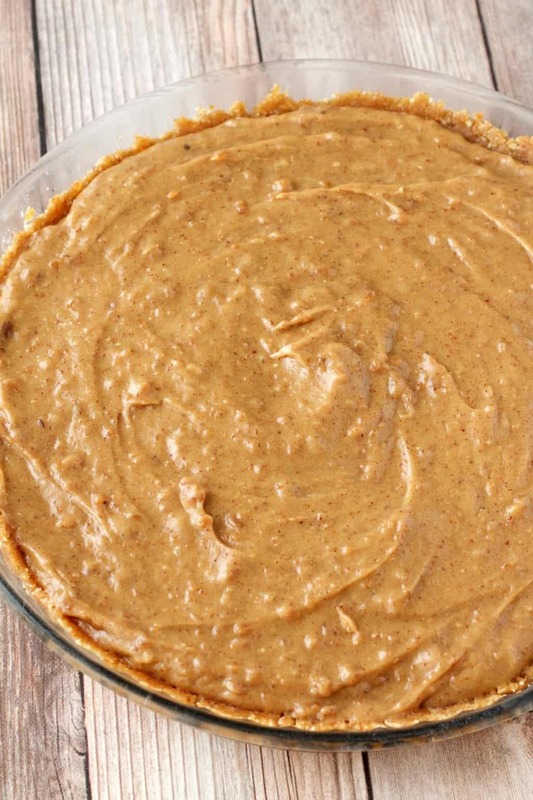 Add in the almond butter and process until well mixed in. Spread the date caramel filling out over the walnut/date crust and smooth it out. Return to the freezer to set. To make your whipped cream, you need to have had a can of coconut cream chilling in the fridge overnight at least. Remove the chilled can from the fridge, being careful not to shake it. Open it and you’ll see the cream has risen to the top, leaving the watery part behind. Scoop out only this cream section into the bowl of an electric mixer. Start at slow speed and then gradually increase speed until the cream is whipped. Slice your bananas and then lightly brush them with freshly squeezed lemon juice to avoid discoloration. 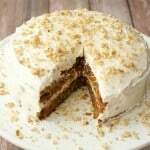 Spread a layer of banana on top of the caramel layer. 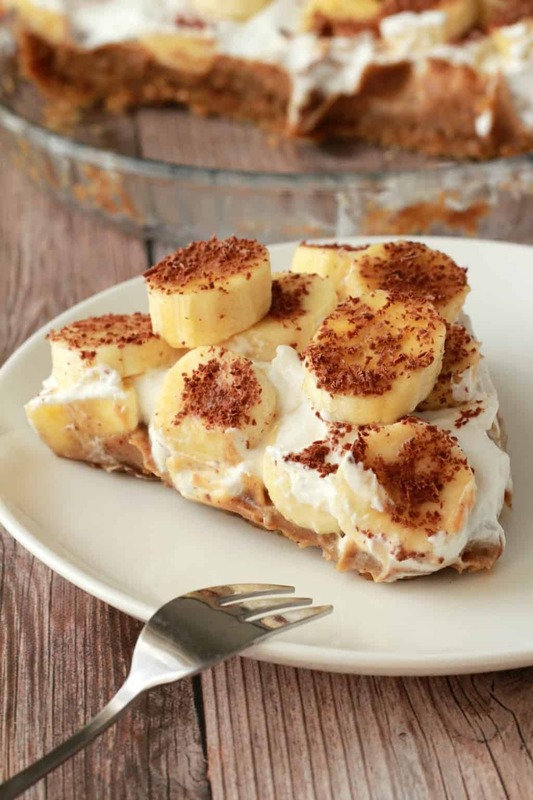 Then spread your whipped cream on top and then add the rest of the sliced banana and finish off with some grated dark chocolate. 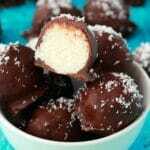 Coconut cream. I know what coconut milk is, amd coconut water. 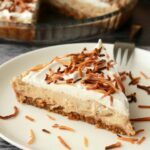 What is coconut cream? It’s like coconut milk, it’s just slightly richer. It’s usually next to the coconut milk in the supermarket. 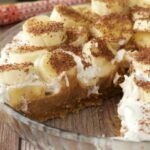 How do I store the pie if I am making the night before and transporting in the morning? 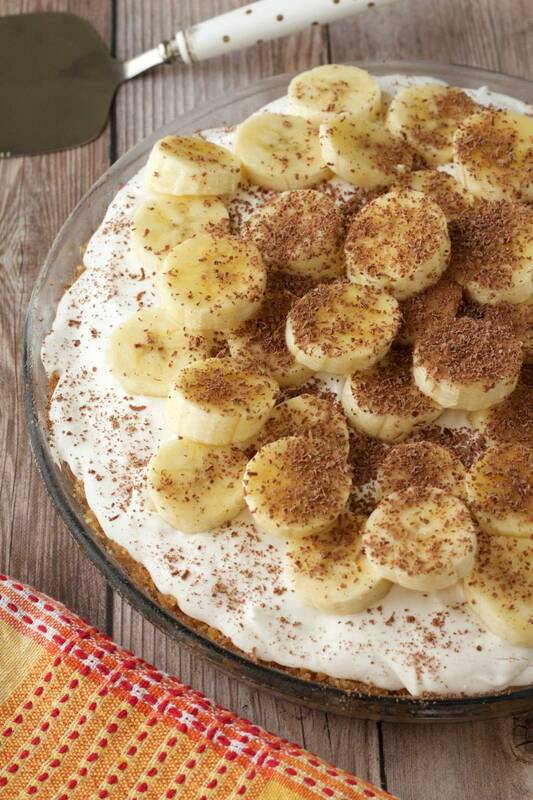 Keep it in the fridge overnight and only add bananas right before you leave. Also put it in the fridge when you get where you’re going as well until it’s ready to be served. Best cake I’ve ever eaten. Really delicious. I added some bourbon vanilla and 3 drops of lemon essential oil for the topping cream. I also soaked bananas in lemon-turmeric juice to get them extra yellow color. Tip: cut bananas with plastic knife and they won’t turn brown. Does this store in the freezer or in the fridge? Could this be frozen ? Hi Minnie, I don’t recommend freezing it, the banana slices get mushy after thawing. I would use a small tetra box, (juice box) of unsweetened pineapple juice. It is much better than the lemon juice, and they will still taste like bananas. Works great in a fruit salad too. Then the juice works as a dressings as well. Hi! Urgent question: I am making this recipe for Christmas day. 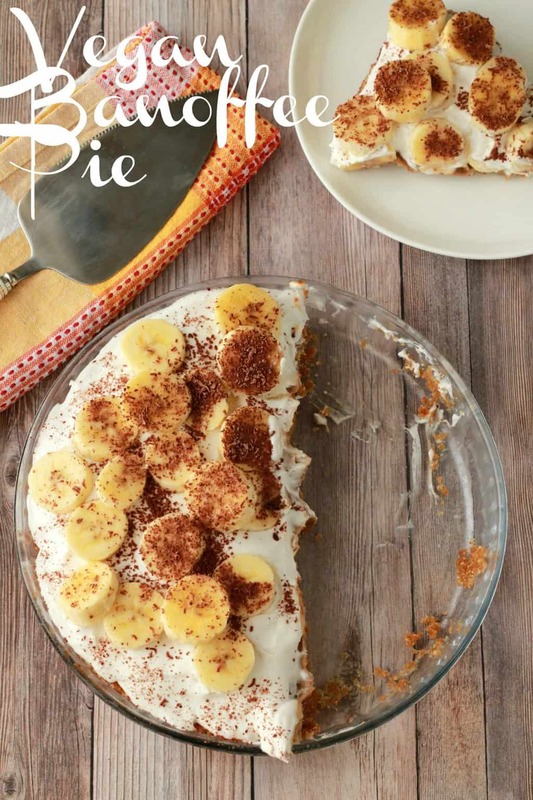 What size pie tin is this recipe for please. (I might be blind but I could not see it anywhere). Thanks! Lovely thanks. I am so looking forward to making this. 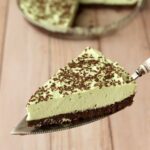 Vegan desserts go down so well with all the pre-vegans. This recipe was superb. I made it yesterday for Christmas dessert and it went down a treat with the pre-vegan family. I added a few spices to the base – cinnamon, cardamom and ginger. And threw some fresh berries on top.